Priorities For Your General Conditioning | Mediterra - Swim & Run Better Than Ever! Many swimmers wonder what kind of exercises they should do on dry-land that would help them with their swimming. I wanted to share with you what I do, what I have been doing for years, to maintain my joints for regular and varied activities, not just for swimming. Before I would encourage a swimmer to work on swimming-specific exercises, I feel it is much more important that you work on general strength and conditioning. (I would say the same thing about nutrition – don’t think about so called ‘sports nutrition’ until you’ve first established good general nutrition habits). You will be able to more safely and effectively train your body for swimming if you first develop a body that is mobile, stable and strong for common human activities on land – as much as that is possible for your particular body and health condition. Here is a list of actions that many specialists say a fully functional human body should be capable of: Standing, squating, lunging, hinging, pushing, pulling, rotating, lifting an object from the floor, carrying a load, walking, rolling over, jumping (or hopping). Can you do all those with some loading and at some decent speed? At this point in life I have a better understanding why my joints failed when I got into competitive swimming in high school – though I was quite an ‘active’ boy and teenager, playing a wide variety of sports, I was not particularly challenged by those recreational activities to build full stability and strength in my joints for all these basic human modes of movement. When I joined the swim team I was energetic and eager, not afraid to work as hard as the coach demanded, but now I realize I was not physically prepared, and the program did not seem to notice that. I jumped into very specialized, very intense training right away. Within two years I was badly injured and exiled from the pool for years because of it. It’s taken me some years to learn the lessons but now I draw inspiration and understanding of how to take care of myself and my athletes from renown physical therapists like Gray Cook, creator of the Functional Movement Screen and Kelly Starrett of Supple Leopard and MobilityWOD fame. I particularly like Starrett’s vision: All humans should be able to perform basic maintenance on their own bodies. I have adopted that attitude as well. Functional Strength – the body can move through the full range of motion under common loading and at necessary speeds. Within this general conditioning package, in this post let’s focus on what I do for my mobility. The first priority is maintaining my spine. I follow the concept of working from the spine-outward to the appendages. The spine is the first piece I work on because it is the foundation for all the other moving parts. It is the center piece of my relationship to gravity and the axis on which I transfer force through my body. The better my spine feels the better everything else goes – especially my cognition and alertness each day. There are many great exercises for the spine. 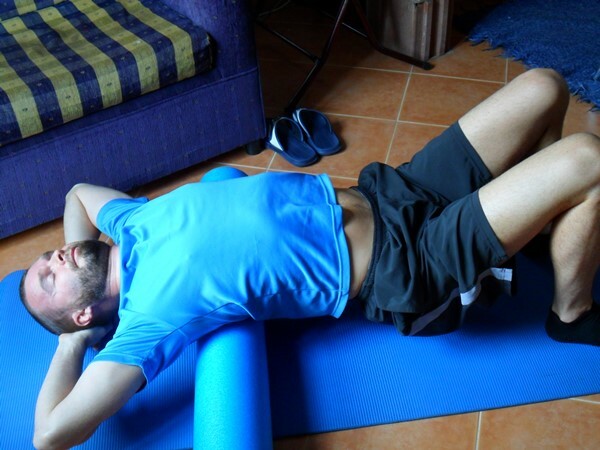 My favorite and first stretch I prefer before anything else is the roll my thoracic spine on my foam roller. If I could do only one stretch on any given day this would be it. if I have only 2 minutes, this would be my first choice. It leaves my nervous system feeling more relaxed. The concept I picked up from Gray Cook and Mike Boyle is the joint-by-joint approach which describes (I paraphrase) how the joints in the human body are set up in alternating order of a need to be ‘stable-mobile-stable-mobile’. To access safest and strongest motion, the looser joints need to develop good stability while the stiffer joints need to develop good flexibility. For example, the cervical spine (the neck) is loose and noodle-like and needs to be aligned and braced. While the thoracic spine (the upper back) is stiff but needs to loosened up to curve in both directions (proper global flexion and extension). The lumbar (the lower back) is loose and noodle-like and needs to be aligned and stabilized. But people commonly stretch their lower back and neck to deal with pain in those locations while doing nothing to improve mobility of the thoracic section. If they would work the thoracic region some people might be surprised the pain in the sections above or below would diminish or go away. The ankle is often stiff (especially for runners) and needs to acquire fuller range of motion. The knee is loose and needs to be stabilized. The hip is often stiff and imbalanced and needs to be loosened up. People suffer from so many knee pains and injuries but if they would examine and improve the function of the hips or ankles they might be surprised how the knee works so much better and doesn’t hurt. Once I surveyed my typical problems and range of motion in other sections I realized I don’t need a more flexible neck or lower back, I need a more flexible thoracic spine. And when I finally started focusing on it, it was amazing how my occasional posture-activated headaches and lower back pain went away (in combination with core/spine strength work). The second priority is keeping full range of motion in my hips. The third priority is keeping full range of motion in my ankles. I won’t bother to recommend or demonstrate any particular exercises because these people mentioned above offer excellent resources, and are the expert’s experts at it. I would also recommend a nicely illustrated book called PreHab Exercise Book For Soft Tissue Therapy by Michael Rosengart. So, if you have a general conditioning routine or would like to acquire one, this outline for mobility tasks might help you improve the one you’ve got, or get started. First work on the spine, and in particular, work on the stiff areas that do not flex in the full range. Next work on the hips to loosen up those tight spots that restrict full range of motion. Next work on the ankles to loosen up those stiff areas that do not permit you to do a full squat. Starrett’s book The Supple Leopard gives some exercises to test and improve your range of motion in the back, hips and ankles. Mind you, general conditioning does not require nor aim at turning anyone into a rubber-like contortion artist. It is not aiming at turning anyone into an extraordinarily flexible person. It is aimed at simply restoring and maintaining the full and healthy range of motion your joints are designed for and which allows you to safely and with strength, perform all those essential human actions. Obviously, you should seek out a live training session with a mobility specialist if you have any doubts or concerns about your joints. My next recommendation for you is to develop a 5 minute, 15 minute and a 30+ minute routine. If you woke up and had to be out the door right away, if you could only spare 5 minutes, which two or three exercises would leave you feeling the most open and ready to move and think for the day? The 5 minute routine would include just 2 or 3 of the most positively impacting exercises you could do in a few minutes. I would definitely include something for the spine. Then the 15 minute routine inserts a few more high priority exercises – including something for the spine, hips and ankles. This would be the essentials I feel are most helpful before or after I do a strenuous activity – they would loosen up what needs to be loosened in order to work and brace the parts that need to be stable. The 30+ minute routine would include all your favorites, or the full list recommended by your trainer. When To Do Your Routine? That’s a good question. I think you should experiment to see what works for your body – before practice, after, or on another day. For me, I do not stretch before swimming though I do dynamic stretching before running – my body responds differently to the two environments. My warm up time in the water starts extremely gentle and as I listen to my body I move in response to loosen up and gradually increase intensity as the body indicates. It’s been quite reliable. I do the same gentle approach to running, but I find some dynamic stretching prepares me better for the immediate pounding that even gentle running imposes. The thing you need to keep in mind is that some parts of the body need to actually stiffen up before you begin intense work, because those parts are meant to be stable under loading. While other parts need to be loosened in order to work and transfer force smoothly. So, don’t just stretch body parts indiscriminately – stretch that which needs to be longer and loose, and do stability exercises for parts that need to be reminded to be stable. You need to be considerate of your own vulnerable spots and how much you can prepare those areas in act of gentle swimming, and how much need some attention before. I aim to do my general conditioning work two or three times a week. Over the years I have reached a nicely conditioned state and I seem to be able to maintain it on just one or two times a week, but it feels good to do more if I can.